It has been an incredibly rewarding, and equally exhausting, few months. I launched my first crowdfunding effort for “No Alternative” on Indiegogo, which succeeded in raising over $50,000 for the project. While it missed the mark of my goal, this is a big chunk of the budget that will, no doubt, help the film get off the ground. I have so many people to thank for their stalwart support. People I went to school with—every school I’ve ever attended: grammar school, high school, college, graduate school—were there for me. My filmmaking mentors in those schools, like Steve Vineberg, Ed Isser, D.C. Fontana and Jim McBride, all threw into the pot. People who I’ve known all my life, people who I’ve only met once or twice, came to my aid. There were total strangers, who took time out of their days to watch the crowdfunding video and read up on the project, that contributed, some of whom contributed very large sums. There was even some celebrity love from the likes of Greg Poehler (“You, Me, Her”), Cassidy Freeman (“Longmire,” “Smallville”) and Kimmy Robertson (“Twin Peaks”). Perhaps most inspiring was a donation from the head of film production at Amazon Studios, Ted Hope, a renowned producer and studio head who prides himself on supporting indie film and director-driven, personal movies. 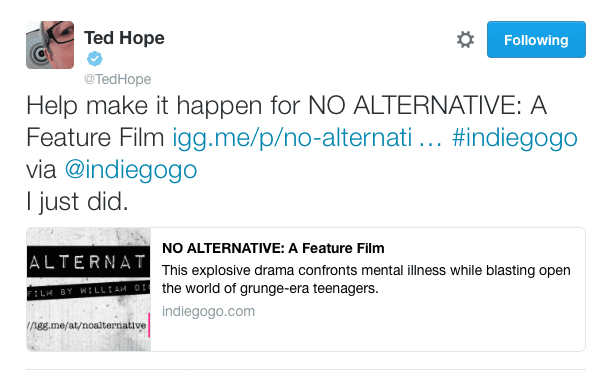 The campaign for “No Alternative” struck a nerve, as evidenced by our 500+ backers, features in publications like Filmmaker Magazine, Film Slate Magazine, Indiewire and Moviemaker, and the countless messages I’ve received from people affected by mental illness on a daily basis. As many of you know, the character of Bri Da B in “No Alternative” is inspired by my sister, Briana, who suffered from Borderline Personality Disorder. One of the ways she was able to cope with it was through rapping. When the character of Bridget becomes Bri Da B, that transformation into someone else helps lessen her pain. “No Alternative” has always been a love letter to my sister, a plea for her survival. That’s why I wrote the novel that the film is based on. I wish I could tell you that plea was successful. But, unfortunately, I can’t. The majority of my sister’s life was a battle fought against her mental illness, drug addiction and suicidal behavior. A battle she ultimately succumbed to. While she may have lost her battle, I’m hopeful we can win the war—and after talking to so many other sufferers out there throughout this process, I’m confident we can. The issue of mental illness must, and will, be destigmatized and “No Alternative” is just one step in that direction. I also must thank From The Heart Productions, who sponsored us as a 501(c)3 non-profit organization that supports films that contribute to society. 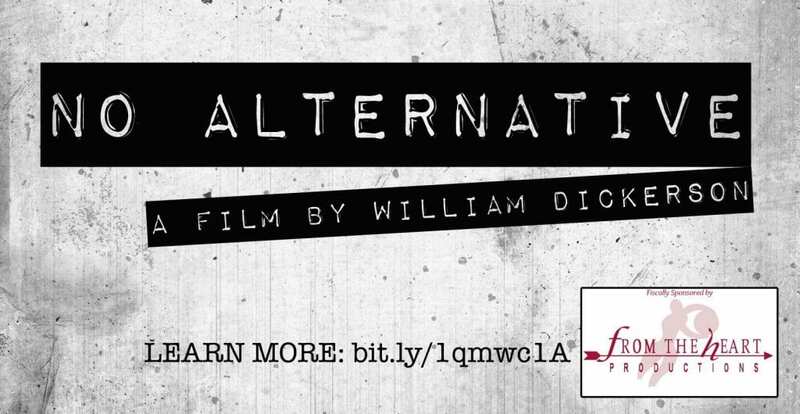 Each donation pledged to “No Alternative” not only helps our film, but also helps other socially conscious films get made. From The Heart has encouraged us to continue raising money for “No Alternative,” and is hosting an extension of our crowdfunding campaign on Network For Good. What we’ve raised thus far will help us through pre-production and lead us into production. But, we aren’t quite done. This second campaign through From The Heart is meant to build on the momentum we’ve gained and get us through production and into post-production. Remember: EVERY DOLLAR COUNTS. The more we can raise, the higher quality we can achieve—whether it means we can pay for one or two extra crew members, secure an additional day of shooting, or be able to afford the rights to the perfect 90s soundtrack—quite literally, each and every cent matters. The spirit of “No Alternative” is DIY—do-it-yourself, punk rock, an ethos I truly believe in. But I can’t make this movie alone—I need your help to make it. Please share, contribute and help us continue to build on this momentum into production! In doing so, we can keep the very important conversation about ending the stigma of mental illness alive. I am extremely grateful for the support thus far. Thank you so very much.